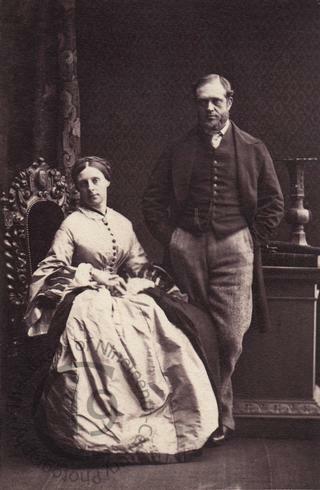 A carte-de-visite portrait of Sir Warwick Charles Morshead and his wife, Lady Selina Anne Morshead. Born in 1824, Warwick Charles Morshead was the son of Sir Frederick Treise Morshead, of Trenant Park in the County of Cornwall, and his wife Jane née Warwick. He was baptised on 30 December 1824 at Crosthwaite in Cumberland. Four years later he inherited his father’s baronetcy. On 8 June 1854 he married Selina Anne Harcourt, the daughter of Reverend William Harcourt, the Rector of Bolton Percy in Yorkshire, and his wife Matilda Mary née Gooch. The marriage produced no children. The couple appear on the 1861 census living at Binfield in Berkshire. Sir Warwick gave for his profession; ‘J.P. for Berks late Capt. Dragoons.' The household included six servants, among them a footman and coachman. On the night that the 1871 census was taken, Sir Warwick and his wife were visiting Lady Morshead’s brother Edward William Vernon Harcourt at Nuneham Courtenay in Oxfordshire. Lady Selina Morshead died, aged 49, on 14 September 1883. Sir Warwick remarried in 1887. His second wife was Sarah Elizabeth Wilmot. Sir Warwick Morshead died, aged 80, on 17 March 1905, leaving an estate valued at £75707. He was buried at Blisland in Cornwall. On his death, his title became extinct. Photographed by Camille Silvy of London on 19 April 1861. From an album compiled by the naturalist, editor, travel writer and Conservative politician Edward William Vernon Harcourt (1825-1891), who served as MP for Oxfordshire from 1878 to 1885 and for Henley from 1885 to 1886.